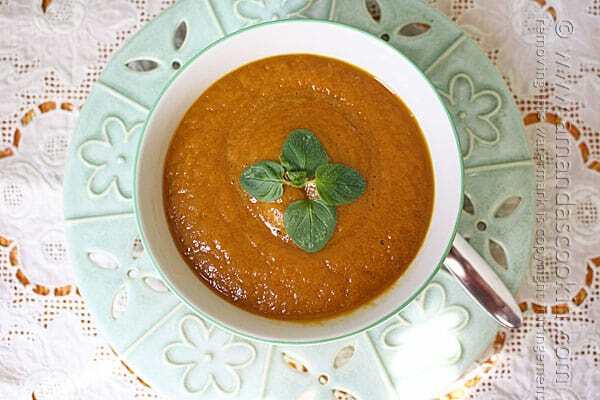 Do you still have some canned pumpkin puree hanging around after Thanksgiving? 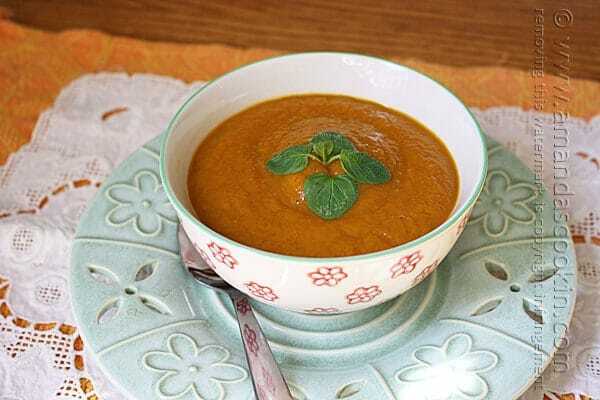 It’s soup weather now, so turn some of those cans into some delicious and creamy pumpkin soup that you can make in the crockpot. 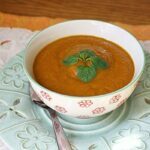 I had actually never had slow cooker pumpkin soup before making this, and now it’s on my list of things to make again and again! For those of you that prefer a vegan option, simply swap out the chicken broth for vegetable broth and skip the half & half garnish. This soup is also gluten free. RELATED: Here’s some more comfort food for you – crockpot mac and cheese! This winter warm up is easy to throw together and can cook while you are out running errands, shopping or picking up kids. 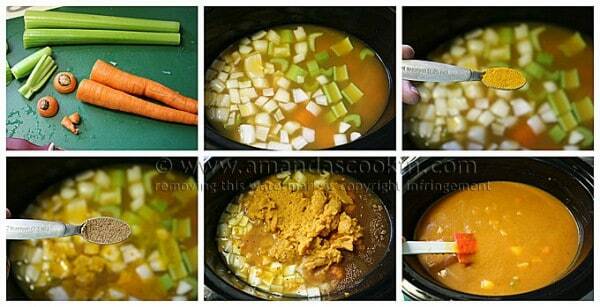 Combine all ingredients in slow cooker and cook on high for 4 hours. Transfer contents of slow cooker to a blender or food processor. You can also leave the ingredients in the crock and use an immersion blender. Process the soup until smooth. Ladle hot soup into bowls. Add a teaspoon of half and half to the top of the soup and swirl it with a knife. Top with a sprig of fresh parsley. For the purposes of featuring a post from Amanda’s Cookin’, you may use one photo that must be credited and linked back to the appropriate post on this blog. Please do NOT copy and paste anything (such as ingredients and directions) from this website as it constitutes a violation of the AF/AC copyright. Your pumpkin soup recipe will not print. Your peanut brittle does print..just thought maybe you wanted your tech people to correct. Hi Marilyn. 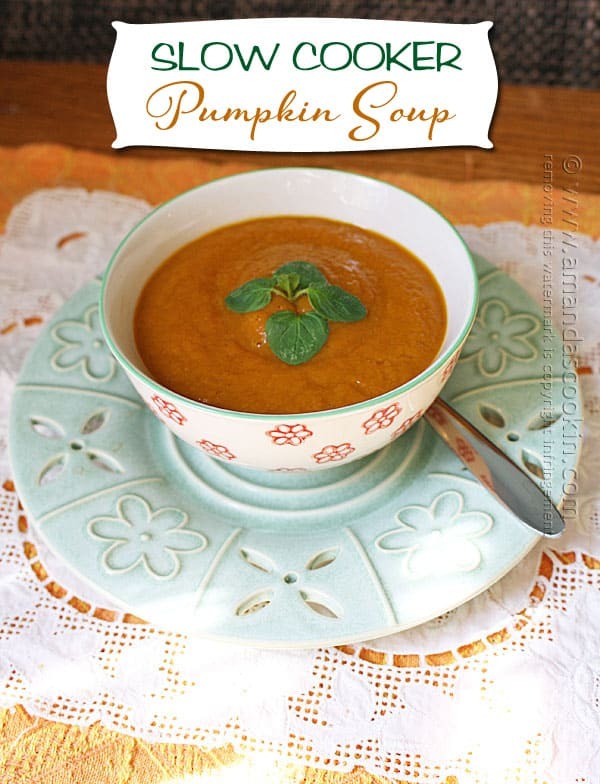 I was just able to successfully print the pumpkin soup recipe. Did you use the print button at the end of the post? There’s a small picture of the soup and just below that is the print button.